Delivering the right message to the right person at the right time is tricky. But existing techniques and new technology are upping the ante in an emerging trend called content personalization. Your content marketing could benefit big time from it — especially if you cater to different audience segments. Content personalization (or customization — take your pick) is a strategy that relies on visitor data to deliver relevant content based on audience interests and motivations. It ranges from a highly targeted call to action to a revolving landing page based on geographic or industry-specific segments. It’s a user experience shortcut that connects your audience with the information it needs more quickly, enhancing the chance of converting the lead. 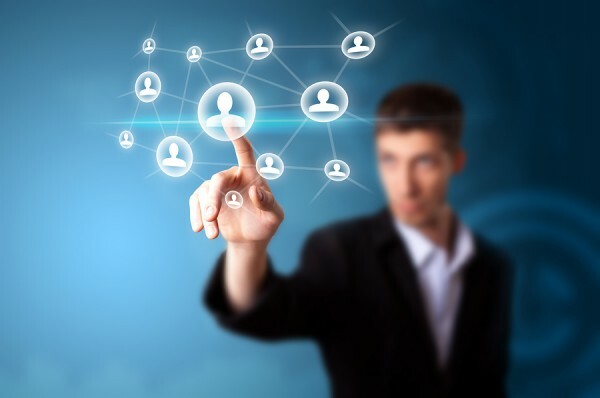 For example, B2B marketers targeting professional service firms may use personalization to deliver unique content to attorneys and engineers, respectively. There are countless use case scenarios where the strategy comes in handy. As a content marketer, a thorough audience analysis will help you weigh the value of using the strategy. From placing cookies in a visitor’s browser to simply asking for visitor information, content marketers have a variety of options to help them get started with personalizing their content. But first, content marketers must understand what makes segmentation thrive. Which data points are important for delivering personalized content? Dynamic websites, or websites that can automatically display different content based on predefined user profiles, are clearly the next phase in content management — even though we’ve had the capability for years (we’ve always been able to collect information from willing participants). According to a recent survey performed by Econsultancy and Adobe, half of surveyed marketers espouse the importance of content personalization in their digital strategies. But only 32 percent of marketers say their CMS accelerates content personalization. According to Loni Kao Stark, Director of Product and Industry Marketing for Adobe Digital Marketing Solutions, you shouldn’t count out your old platforms just yet: “Data in legacy CRM and ERP systems, when combined with analytics and insights on customer behavior from digital channels including web, mobile and social, provide a unified context that’s useful for content personalization,” she explains. “They’re important pieces of the puzzle. The trick now is to reveal visitor intent and react in real time. Her company engineered Adobe CQ to do exactly that. The product is core to the Adobe Web Experience Management solution, which can deliver personalized content based on different personas. The solution works to understand visitor context, typically based on a combination of digital analytics combined with CRM data, before it delivers personalized content, making it a strong option for qualified leads and previous customers. Location: If clothing is your niche, you may want to deliver different types of content to a visitor from Florida than one from Alaska. While collecting locational data has gotten easier, sometimes you need confirmation for a long-term commitment. Groupon, for instance, asks you to confirm your location as soon as you visit the site so it can deliver accurate geo-targeted offerings. Interest: If your content targets different industries, niches, or general interests, finding the visitor’s top-level motivation requires you to understand the goals of the category that visitor best fits into. Collecting this information may require asking for it on the landing page — or, in some lucky cases, sourcing it from social sign-in information. Referral: Watching where your traffic comes from is also a powerful way to help segment your audience. You might want to deliver different content to a visitor who clicked a Google Ad for a specific keyword than you would an inbound visitor who arrived through a guest blog post, for example. With visitor opt-in: When visitors offer information willingly, it’s usually solicited through surveys or forms, as well as through social identification channels like Facebook Connect that give you access to profile information. Without visitor opt-in: Predictive data points, on the other hand, don’t always require action on the part of the visitor. In fact, the Econsultancy/Adobe study mentioned above found that 42 percent of surveyed marketers claim they personalize using anonymous data. Marketers already track geographic data by IP address, cookies can track user behavior across your website, and analytics platforms can identify where referrals come from. Collecting the data is one thing, but how do you use that data to deliver targeted content? Using the collected data, content marketers can define different audience types, simplifying how they target with content. Your next step is actually delivering that content. 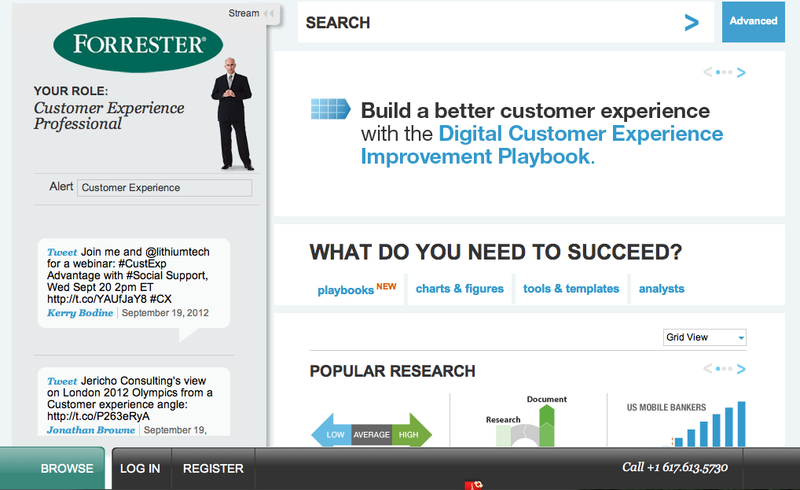 Research firm Forrester puts content customization into play from the second the visitor reaches the home page. The website asks visitors to choose their “role,” parsing out content based on the visitor’s preferences. 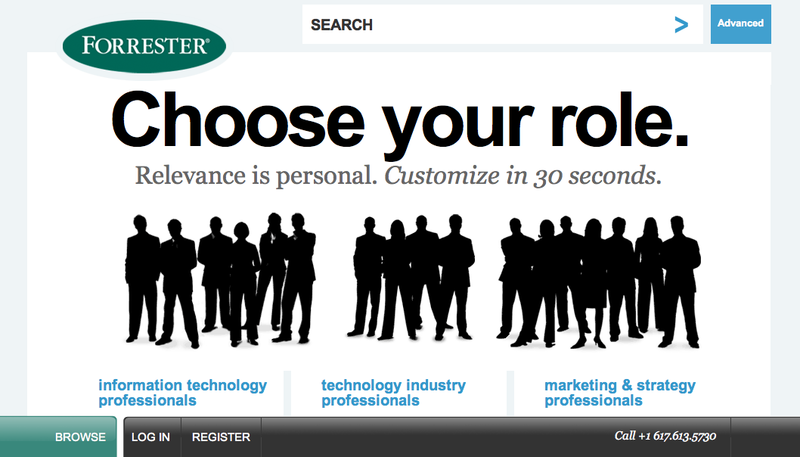 Visitors can define themselves as “information technology professionals,” “technology industry professionals” or “marketing & strategy professionals.” From there, Forrester makes it simple to narrow your focus even further. If you choose “marketing & strategy professionals,” for example, you’re prompted with seven more ways to narrow your experience, including niches around consumer product strategy, customer experience, and more. The next time the visitor logs in, she sees a home page vastly different from the original — shortening the path between her and her most sought-after content. Be transparent: For content marketing, what’s more important than trust? It’s probably one of the goals of your strategy in the first place. Abusing that trust could transform content personalization from helper to hazard. Think small: Content personalization doesn’t have to be complicated. Why would you need hundreds of different audience segments? Think small and you’ll avoid a convoluted nightmare. Localize assets: We covered the importance of form-agnostic content a few weeks ago. It’s even more important for content personalization, which may require you to feature the same content in different presentations. Integrate your CRM: To simplify how you identify visitors, hook everything together with your CRM processes. After all, it’s easier to deliver personalized content to existing customers. With this road map in hand, now you need a few practical tips to get your content personalization strategy up and running. Step 1: Find out if your CMS already has the capability: OpenText is an example of a CMS with built-in customization capabilities. Check with your CMS provider to find out whether or not these capabilities are available or in the works. If your website is personalization-ready, you may need to do some configuring. But it’s likely you won’t have to invest in more tools. Step 2: Define your audience segments: Taking into account Loni’s suggestions on keeping things simple, choose your audience segments — start with your top two or three, at first. Make sure that each segment is different enough to warrant its own personalized set of content. Remember: The more segments you define, the more content you’ll have to create overall. Step 4: Configure rules and create segmented content: The personalization tool you choose will require you to create rules based on your audience segments. And, of course, you’ll have to do what you do best as a content marketer: create high-value content for each of your user profiles. What other tips do you have for content personalization? Share them with us in the comments. Learn which tactics your peers are turning to for more effective content marketing creation and delivery. Read our eBook, Building the Perfect Content Marketing Mix: Execution Tactics.